The trend in recent years has been toward blended menus, those offering foods of several countries. For example, there are “Mediterranean” restaurants in the metropolitan area that have dotted their menus with bits of Spain, Provençal France, Italy, Morocco and Greece. The idea is to represent as many cultures as possible that touch the Mediterranean Sea. Some also describe themselves as “fusion” restaurants. Asian fusion is also popular now. But more often, con-fusion is the result, a problem caused by overreaching and an inability to deliver any one dish effectively. Doing a lot of things poorly, rather than a few things well, has its consequences. Mon Jin Lau, the multi-Asian restaurant in Troy, has risen above all that. It’s been defying such restaurant gravity for 37 years. From its inception, it had the reputation of being an “upper-end” Chinese restaurant that’s been continuously innovative and tony while remaining casual. It’s the premier Asian restaurant in metro Detroit, and it has no mate here. To find something similar means traveling to San Francisco, where the heart of West Coast culture is dominated by Asia. California’s architecture, literature, film, theater, and especially its food, all are influenced by Asia. Mon Jin Lau reminds me of some of those city’s hip Chinese or Asian restaurants. Take San Francisco’s wonderful Slanted Door, a “Vietnamese” gem that thematically begins in the exotic blend of cooking of the colonial French-Vietnamese era, but is reinterpreted in American West Coast sleekness that marks both the progression of its food and the design and architecture of the restaurant. “New Vietnamese” would be a far more accurate description. When it opened in 1969, Mon Jin Lau offered Cantonese-style food, which was what people understood to be Chinese. Then came the Polynesian movement, along with exotic drinks with little parasols in them. That was followed by spicy Szechuan and Hunan cooking. The restaurant adjusted fast to each, adding them to the menu. What has kept Mon Jin Lau constantly in the forefront is the cooking. It rarely misses, and the knowledge of its current cooking team of chefs from all over Asia certainly shows why. The dishes range from simple standards – egg foo yong, moo shoo pork, sweet and sour chicken – to more complex Chilean sea bass wrapped in banana leaves with Asian vegetables and a spiced coconut sauce, to quail with a plum sauce and ginger, and a delightful eggplant Napoleon with Chinese noodles. Mon Jin Lau also has one the most extensive wine lists to be found at a Chinese restaurant. The concentration is largely white, dry and aromatic wines with great acidity, wines that will handle the spices in Asian food, like those of the Alsace region of France. “Wine has been a big part of what we do for years,” Chin says. Mon Jin Lau has a distinctly hip feel and is as far away from the immigrant stereotype as Nobu is from a barn dance hall. From the graceful neo-temple feel of the entrance, to the glass case in the front hallway in which are entombed items from Danny DeVito and Madonna – a breast plate from an album cover during her “material girl” life – to the wall of photos of the famous and not so famous who have been to Mon Jin Lau, all lend a sense of energy and amusement. For most of the last 20 years, Mon Jin Lau has been associated with Marshall Chin and his brother, Marco. In fact, it’s the legacy of a continuously curious and entrepreneurial extended family of Chins and Chungs, whose roots in Detroit go back to the 1920s, when a Cantonese immigrant named Jin Chin opened a Chinese laundry and then a grocery store. Chin was widowed twice and returned to Canton at age 50 to marry his third wife, a very young and dynamic woman named Mon. He returned to Detroit with his new bride, promising her family that he would support them from America and that he would eventually bring them here also, which he did. Chin’s extended family moved into the restaurant business, which included another son, Marvin Chin, who owned Chin-Tiki. He died in April. But it was Mon, Marshall’s mother, who in 1969 drove out to a corner in the remote farmland of Troy, where she found a lounge for sale called the Chateau Gay at the corner of Stephenson Highway and Maple Road. Jin Chin named his restaurant after him and his wife, Mon, and added the Chinese word for house – or “lau” – at the end. Mon Jin Lau was born. It so happens that the names strung together also mean “House of Ten Thousand Jewels,” Chin says. He chuckles now when he thinks back to the 1970s, a time when Chinese words and names just weren’t used on restaurants, and he challenged his mother’s choice. “Couldn’t you have called it the ‘Golden Dragon’ or something?” he recalls asking her. Mon is retired now. Jin died in 1982, and Marshall has been the day-to-day face of the restaurant for about two decades. He’s made several additions, such as French doors, large stands of bamboo and landscaping. But the basic décor and design of the place go back to 1969 and Mon Chin’s vision. Large pastoral panels she commissioned in red, gold and black still adorn the dining area adjacent to the bar. The extensive bar and a series of vibrant, colorful Chinese portraits that Mon Chin commissioned haven’t changed. “It’s a tribute to my mother that her basic ideas for the look and feel still works,” Chin says. The newest addition is an outdoor terrace for al fresco dining with a bamboo fence shipped from China, a work still in progress. Chin says he gets his inspiration and ideas from visits to Asia. “Shanghai is the city of tomorrow. I’m really impressed with the restaurants and the wealth and westernization going on there. There are incredible designs and building of new restaurants. And they are traditional yet modern. I want to mimic that. I like that metamorphosis. I believe that’s why we’ve stayed in the forefront at Mon Jin Lau. Understanding our classic cooking and being innovative has let us bridge both worlds.” It seems likely that a restaurant of tomorrow may soon metamorphose through the Chin family. Marshall, now in his 50s, said his two sons, Brandon and Brian, both college graduates, have recently started working in the family business. “They grew up with it. They know it. It’s in their blood. And, in a way it makes me feel more secure to think that the boys really want to do this,” he says. 1515 E. Maple at Stephenson, Troy; 248-689-2332. L&D Mon.-Fri. D only Sat.-Sun. 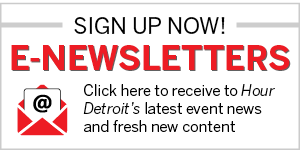 Cook is the chief restaurant critic of “Hour Detroit.” E-mail: editorial@hourdetroit.com.